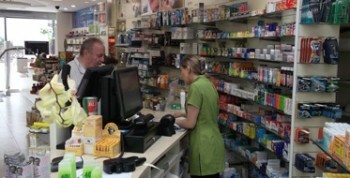 Fast & robust sales and inventory management system tailored to UK pharmacies. 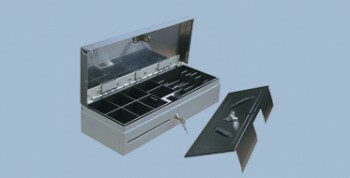 Quick and easy to use sale system for counter till operation. Simple and intuitive to set up stock, price updates, product linking, pharmacy service alerts, dead stock, expiry dates and many more. Set up promotions with automatic shelf edge label printing. Weekly C&D updates with price comparison report. Internet functionality to transmit purchase orders to suppliers like Alliance, AAH, Enterprise, Phoenix and Lexon. 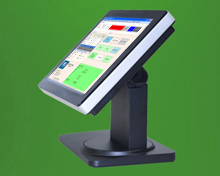 ATL EPOS System is the tool to manage your pharmacy counter operations. ATL’s unique features and robust counter solutions can eliminate the traditional or third party systems and strategically align with your business processes. 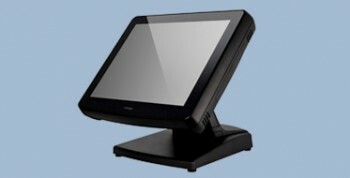 We are constantly thinking about new ways to develop our EPOS system and make it even more superior. We achieve this by making our system more user-friendly, cost effective and most importantly we also make sure that the pharmacies stay up to date with the pharmaceutical industry. We listen and analyse our customer’s requirements and keep them updated about our system innovations to enable them to harness our technology to its fullest advantage. The Pharmacy Management Module and Responsible Pharmacist feature enables you to keep all of your records up to date and efficiently manage your pharmacy. Facility to create promotional special offers e.g “buy one get one free”. Invoice entry module to enter any purchase invoice in your pharmacy. Chemist and Druggist updates with price comparison reports. Staff task module (enables you to easily assign tasks to your staff). Manage staff holidays & time sheets. Manage multiple bar codes for your products. Print shelf labels using zebra or receipt printer. Keep records for multiple fridge temperatures, room temperatures and print reports in date order. NHS and private prescription takings. Access analytics which detail your pharmacy’s busiest times. Ability to provide you with an analysis for your highest selling products, lowest selling products and dead stock. Product grouping based on department categories, brands and manufactures. Advice can be recorded with just the press of a button. It also contains a facility to print reports and provides an analysis of advice given in the pharmacy. The system is user friendly and the features are organised intuitively so staff can provide a better and more efficient service to their customers. ATL Systems provides a detailed stock control methods and techniques that would save you money, following a few highlighted features that will impact your pharmacy operation and can make significant savings in your pharmacy. Setting up minimum and maximum stock level and suggested sales order by the system reduces excess ordering and creating dead stock. Setup promotions, analyse sales for: Fast and Slow moving lines, not sold since and average sales forecast. All these combined can provide an increase in turnover. Keep your prices up to date with the Chemist and Druggist weekly updates; these updates will be downloaded to your tills automatically over the internet. Price changes and Shelf Edge Labels can then be printed easily. You can exclude specific items or departments from updating prices during C&D updates. Shelf Edge Labels can be printed in thermal receipt printers, therefore there is no extra cost of buying expensive labels and printers. You can view wide range of management reports so you know exactly what is happening in your business. The reports consist of: Sales summary, sales statistics, customer statement, top sellers and non-sellers. Our software allows Pharmacies to manage customer accounts, invoices, statements and credit notes, purchase invoices recording and full accounts summary to analyse expenditure in a day to day pharmacy business. Equipped with up to Intel Pentium B950 2.1GHz CPU (Optional) and DDR3 memory. 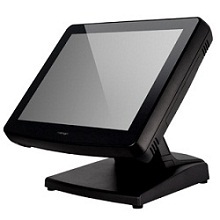 Resistive, IR, Bezel-free Resistive, or Bezel-free PC touch screen (Bezel-free option for JIVA KS-7515 only). 15” LCD 1024 x 768 resolution. UPS (Embedded on main board developed by Posiflex) support to avoid sudden loss of power during transaction. FanFree design boasting quiet and anti-dust features. Patented aluminium die casting design for efficient cooling. 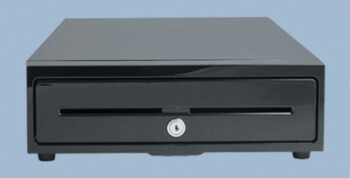 Push-open cover to protect power switch from accidental shutdown. Bottom cable guide design and cover for safety and neat outlook. 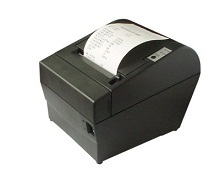 EPOS thermal receipt printer with compact, minimalist splash-proof lacquered black or white finish – and a convenient front receipt printout. 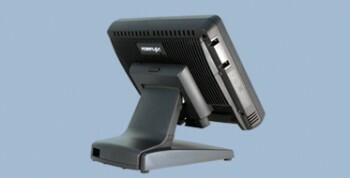 Specially developed for point-of-sale and service applications. 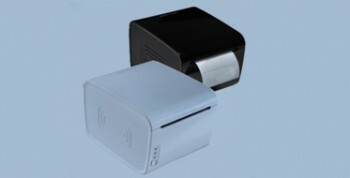 This thermal receipt printer features a trendy minimalist style, lacquered finish and compact dimensions and a great modern design. The printer is one of the few in the market to feature a front receipt printout, ensuring better protection against dust, crumbs and liquid splashes in tough environments. 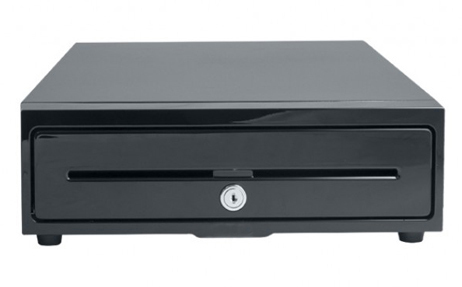 A vital component on any point of sale, the cash drawer is an essential companion to AURES’ POS desk equipment. 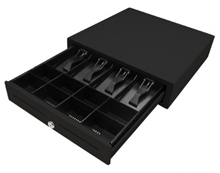 The 3S 430 has a removable spacer system for 8 types of notes and 8 types of coins. Two slots on the front side are used for receipts, cheques and removable inserts. 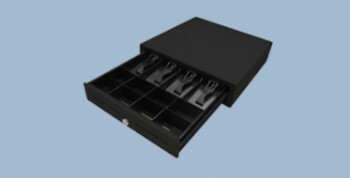 This cash-desk equipment features rounded edges and steel clips to hold down notes and is available in beige or in black. Green or Blue screen filter. Two-line display with 20 characters per line. Large character size for easy viewing : 9.03 mm x 5.25 mm. 15°, 30° and 45° tilt angle adjustment. Various command emulations selectable by DIP switch: ADM, Aedex, ESC/POS, Futaba, Noritake, UTC. 12 international character sets support. 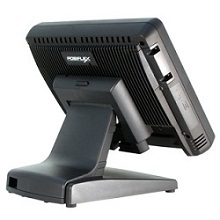 Rear-mount for Posiflex XT series terminal. 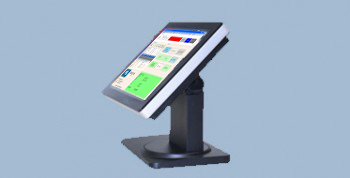 W-TOUCH is an integrated 15-inch touch screen till equipment: only 48 mm thick, this is all neatly presented on a slim EPOS system which has been designed for wall –or stand – or pole mounted applications, freeing up space at your cash desk. It can be easily adapted to both checkout and self-checkout set ups and is available in two colours, graphite black and pure white. 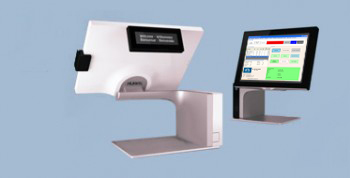 Our highly trained and qualified engineers will visit your pharmacy with the EPOS System hardware for installation and also provide you with a full day’s training and manuals. The support service includes both remote and on-site support if a technical or training issue arises, we will provide you with the peace of mind that, whatever happens, a technical engineer will be on hand to help immediately. Any hardware failure will be rectified within 8 working hours either by our engineer visiting your premises or by replacement of the defective hardware. 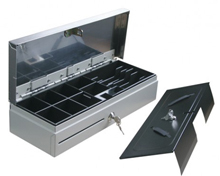 Worried about creating products in your new till ? ATL can help you achieve the creation of products with stock figures and prices by automating the process. We will provide stock take scanners to your pharmacy to scan all the products so that barcodes, price & stock quantity are recorded. 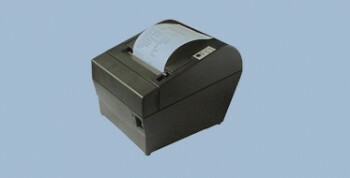 Then we will transfer the data automatically to the till. 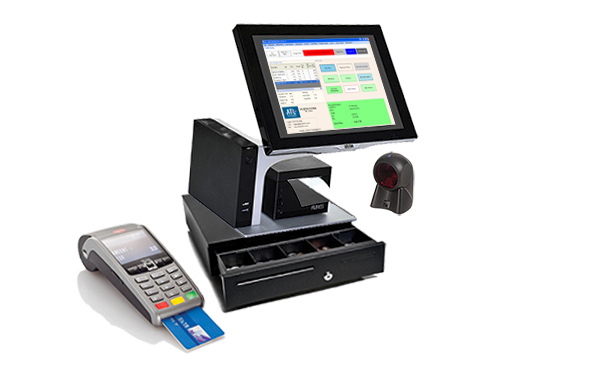 On the day the system goes “live” all your pharmacy products will be available in your till which will give you peace of mind and confidence to you and your staff knowing that all the products with the price and stock figures are uploaded into the system. 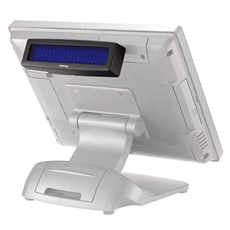 The ATL EPOS System is integrated with internet functionalities, enabling the system to transmit orders to suppliers such as Alliance, AAH, Enterprise, Phoenix and Lexon. 1. To help reduce the level of card fraud, it is mandatory for any merchant accepting card payments to achieve and maintain compliance to the PCI DSS. This helps to protect sensitive cardholder data, but can carry a significant financial cost that can run into millions of pounds for large retailers. 2. Ocius Sentinel can help merchants to cost-effectively achieve and maintain PCI DSS compliance. 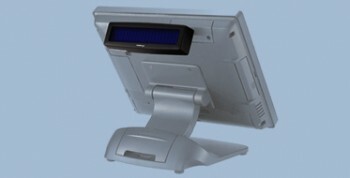 Developed in-house by Commidea, the Ocius Sentinel software resides on the PIN entry device – PED, or payment terminal. It works as the card data is captured, and provides dual-layer data encryption from that point forward. 3. Ocius Sentinel is the UK’s first Payment Application Data Security Standard (PA-DSS) approved solution which utilises this dual-layered point-to-point encryption at the terminal. 4. Ocius Sentinel uses 168bit 3DES and 2048bit RSA encryption, only decrypting the data once it reaches Commidea’s PCI DSS Level 1 certified infrastructure. 5. Process the credit card transactions using broadband. 6. Monitor transactions online using web browser. 7. Terminal will be supplied free of cost. 8. Easy to setup and 24 hours support. 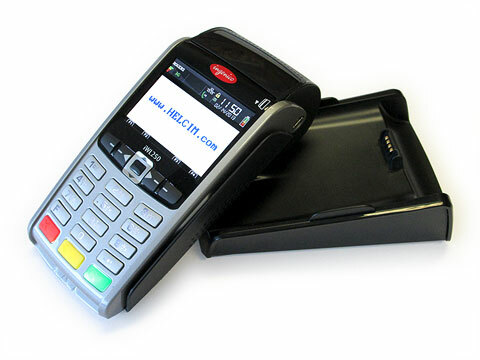 Fast, reliable and secure debit / credit card transactions using integrated chip and pin solution. Easy to carry anywhere and performs stock check, reorders and reporting. Need to access the system while the till is in use? No problem, all you need is a license on the computer in your back office. The ATL Head office solution can be used to manage multiple branches from a central office location and provides flexible reports, sale analysis etc.